Today I'm sharing a furniture makeover on a piece that has been in my home for over two decades. I love this unique table and I've seen it advertised for up to $250.00, so it's definitely a keeper. Sadly, it has been collecting dust in our basement for a few years. I've been wanting to give it a refresh because I miss having it in our living room. 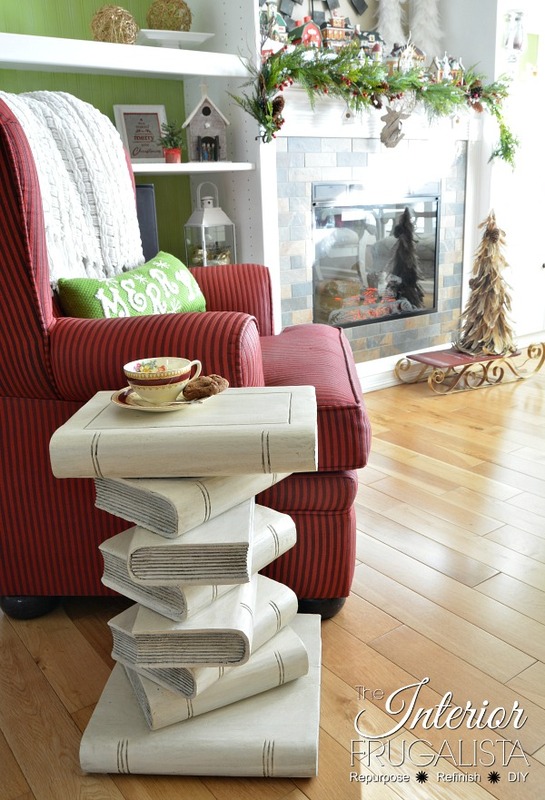 It's the perfect compact table for our small space and a great conversation piece. 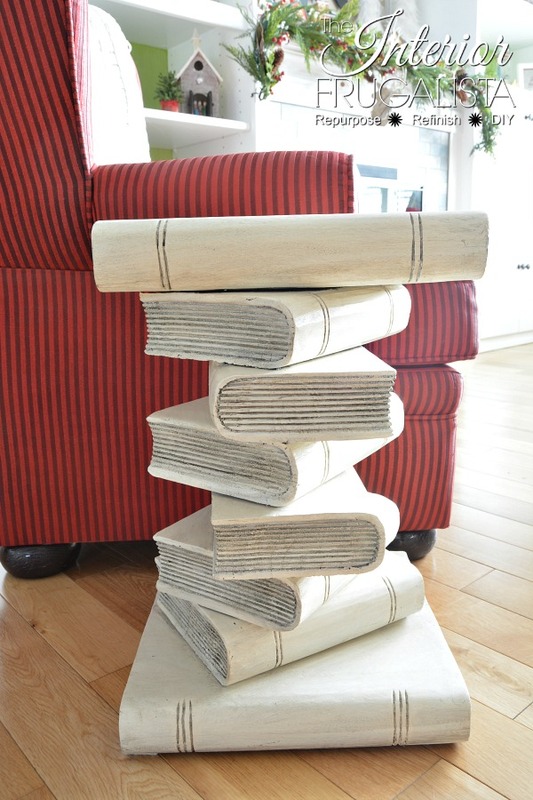 When I learned that the theme this month for Themed Furniture Makeover Day was WORDS, what doesn't say words more than a hand-carved Stacked Books Table. This was such a quick and easy makeover that took only an afternoon to complete but what a difference a can of white paint made! Don't get me wrong, I loved the original finish. It looked great in our formal living room but after we lightened and brightened the space with whites and lime green, this table became the elephant in the room. It took three coats of Dixie Belle chalk paint in the color Buttercream, which is a warm white with yellow undertones, to get complete coverage. In order to give the table a time-worn look, I needed to bring back the layers of dust that used to accumulate in the ridges of the book pages (I can't believe I want to recreate the dirty I worked so hard each week to remove). 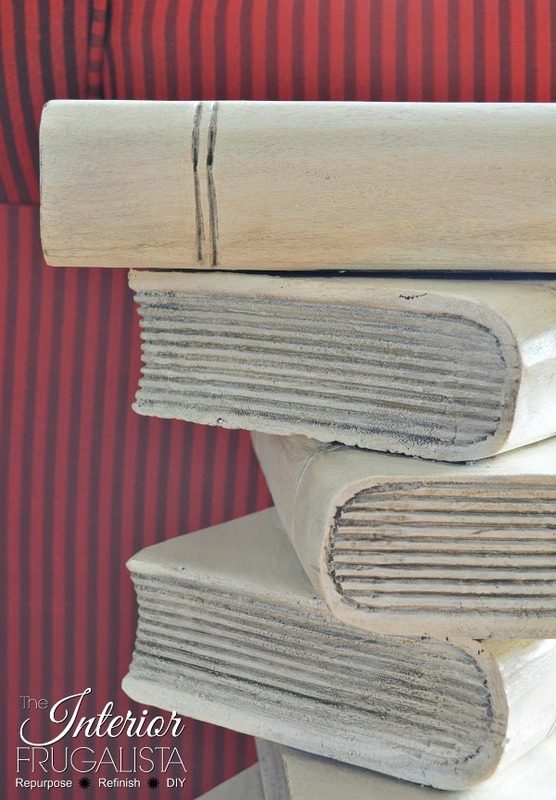 To do that I brushed Dixie Belle Grunge Glaze using a chip brush and also added it to the ridges in the book spines. 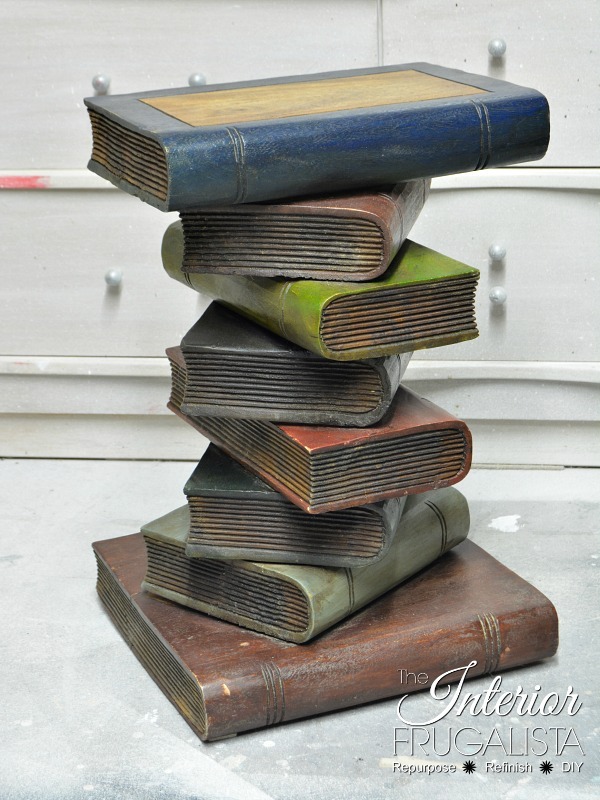 To age the book covers, I brushed a light coat of Grunge Glaze and wiped off the excess. It was that easy! To protect the paint, especially around the base, from those rambunctious hits with the vacuum, I applied a coat of Dixie Belle's Best Dang Wax and buffed to a matte finish. 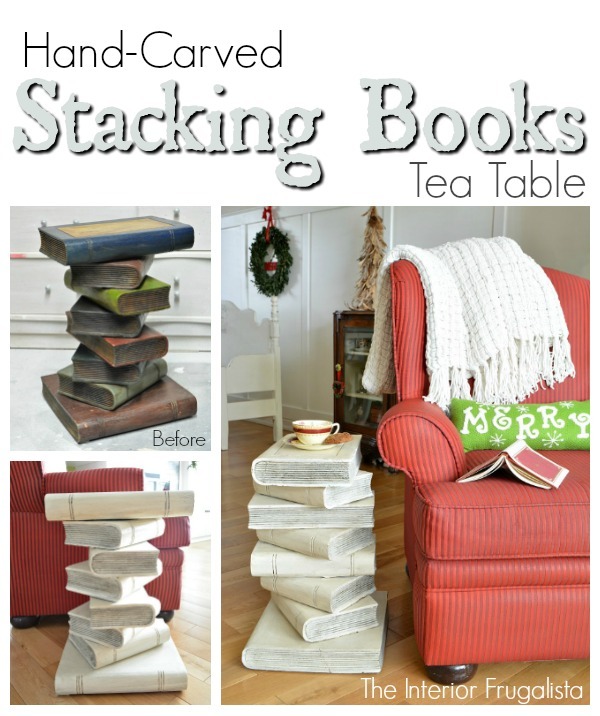 I'm so happy to have my hand-carved stacked books table back in the living room and it fits right in with our more casual decorating theme now. If you like my table refresh, please share it with a friend and/or save it on Pinterest. 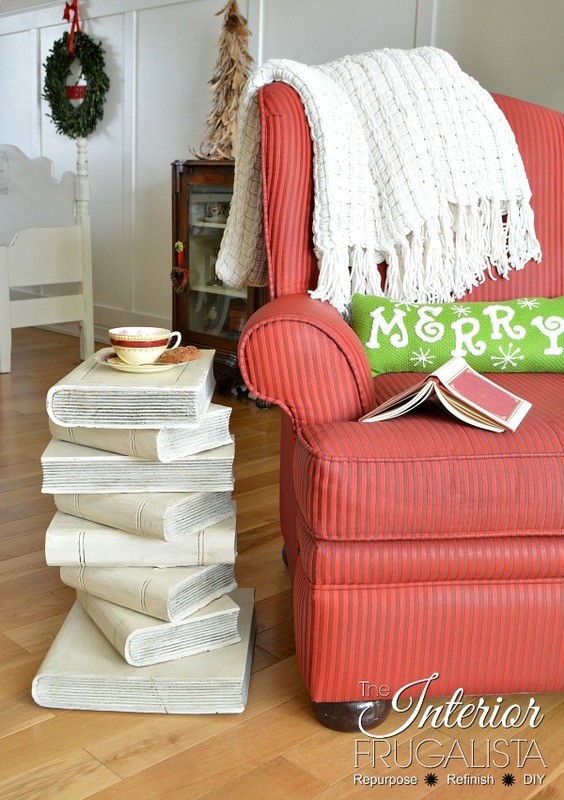 This is our last Themed Furniture Makeover Day challenge of 2016 and I'm looking forward to sharing more fun themes in the new year. For more Words inspired furniture, be sure to visit my talented friends in the Themed Furniture Makeover Girl group by pressing the links below.